A glimpse inside this creative brain. Whenever I hear someone refer to designers as flighty, I have a good chuckle. Most of the creatives I know are the very opposite of flighty—they are pretty regimented. I do not wear pajamas to work nor do I show up late. I’m not even sure where this stereotype came from. I think creativity needs a safe place to thrive, and I create this place with a structured day. ALARM GOES OFF. Before I roll out of bed, I pull out my iPhone and read the New York Times and the Daily Beast. (I still call it reading the paper even though I haven’t had a physical paper in years.) Then I go through my Twitter feed, read design articles, Fast Company, and US Weekly gossip, play Words With Friends, play at least 3 games of solitaire, and check Instagram—until I know what’s going on in my world, and the world at large. As the birds chirp, it’s now or never, because once I get to work, elephants could take flight and I wouldn’t know about it until dinnertime. MOVE BODY. 4-5 days a week, I play tennis or go to the gym in the wee hours of the morning. Outfit includes black t-shirt, black leggings (or black tennis skirt) and fuchsia sneakers. — EMAIL. Iced tea in hand, I look through email, make a list of my daily tasks, and follow up with people on my follow-up list. — TIMER. My timer drives the rest of my day. Whether I’m designing or cleaning up a pile of papers I’ve amassed, I use my timer for motivation and efficiency. Timing things helps me rotate projects so everything is fresh. I follow the Pomodoro Method, and it serves me well. — BREAKS. I give myself a few breaks during the day. I sit outside on the patio by the pool, walk to the mailbox (I have a very long driveway) or make a personal phone call—and get back to work when the timer buzzes. — VERY SPECIAL NOTEBOOKS. I always have a few notebooks with gridded paper on-hand for writing and sketching. (My favorites are Quattro and Fabriano.) Recently the young comic (daughter #2, who is now a math and science teacher) doodled on the cover of my Quattro notebook. I gasped and said “creativity goes INSIDE the notebook” — we laughed. It was a reaction that even surprised me because my youthful notebooks were covered in doodles. But, the notebook sat unused until I tore the cover off, thus removing the spoils of her whimsy. — PENS (black, of course). I never use pencils. If one shows up in my office, I toss it in the garbage. Pilot razor point felt-tipped pens win for sketching; black ballpoint is my preference for writing. I have some ruzow pens here — if you would like me to send you one, email me. — COMMUNITY. A few times a day, I check into my Designer’s Roundtable Facebook group (for whom I spoke at their recent Nashville conference) to ask and answer questions and share resources. I also check-in on LinkedIn and see who has been snooping at my profile, and I shoot them a note to connect. — GOOGLE CALENDAR. Another good taskmaster, Google Calendar keeps me on-track with alarms and reminders throughout the day. It pops up and annoys me; it really should have a snooze button. —ADOBE Illustrator, InDesign, and Photoshop. In that order! Even though I try to do every job in Adobe Illustrator, I must break down and use other parts of this creative suite of products to get my design jobs done right. Throughout the workday, I look out my wall of windows to the world outside. I overlook my yard of ferns and deer, rain and snow, the neighbors’ driveway as they come and go, the edge of my deck and pool, the birds that fly into my window (it’s not that clean!). Somehow they fly away…and at 5 or 6 PM, when the day’s work is done—so do I. 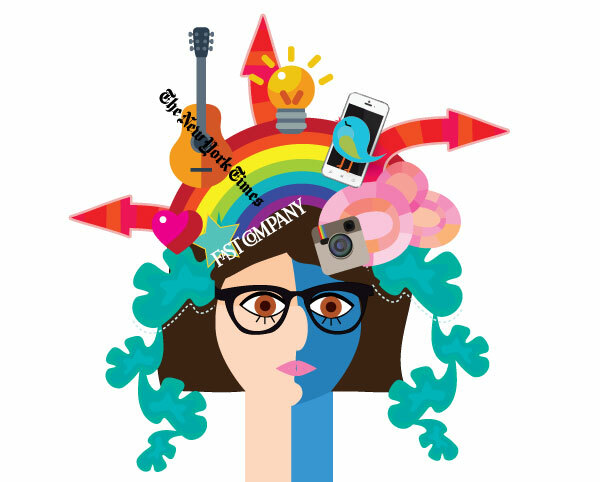 See how a regimented creative can help your business. Pick my brain during a free consult while we both sip iced tea from skinny straws – I can make you coffee, but having never had a cup, I cannot guarantee the results.